Only the inniest of the in crowd get to go to the hot pot party. Except maybe there is such thing as too much hot pot; maybe eating until tummies pop is not without its downfalls and smiling smelly hazes. So when the party is over, does that mean the fun is done? Er, no. Detarame Factory's After HPP is when the good starts happening. After all, when you escape a room, you open a lot of cupboards, take things out and move stuff around, don't you? Well, who do you think puts that stuff away for you? 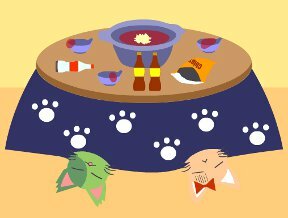 Not those kitties passed out under the table. They're in need of their own aid. So it's up to you to explore the multiple scenes, picking up the clutter, washing dishes and putting it all back where it goes. Of course, some wise guy put new puzzles on the locks when you were busy partying. After HPP begins with this challenge: "After the hot pot party...let's tidy a room!" Um...yay? As it turns out, it's satisfyingly fun albeit a little on the easy side. To play, follow the navigational arrows to change scenes, click to pick up items or zoom into puzzles, and double-click to examine your inventory. Unlike Hot Pot Party, there isn't a MEMO function yet, with fewer puzzles, it's not needed. There's only a couple areas where you might be stymied—when looking for a needed clue-bearing item, the changing cursor helps but you have to be mindful to really look when you take a look. Although there are two endings, one is more a "cleaning is for the birds and I need to rest" than a true end. If you do go that route, return to the game by clicking the "normal end" screen. For perfect end, keep in mind the operative word is "tidy." Very tidy. Maybe you'll question, as I did, why you're playing a game about cleaning house instead of actually cleaning your own house. Because, well, you know. Cuteness, whimsy, fantasizing that housework could be as simple as a point-and-click. After HPP Walkthrough now available! Fun little game! Couldn't help but make a walkthrough for it, though most puzzles should not pose a problem. Note: You can get the normal ending at any time by going to the kitchen and taking a break by eating the cake rolls. This walkthrough details how to get the Happy End (where your house is completely tidy). What a mess! Let's tidy up the house! Two very tired and hung-over kitties. They won't be any help, so let's be the sensible one (I guess it is our own house, after all). Click on all the items on the table to remove them (3 bowls, 3 bottles, and a chips bag). Pick up the leavings of a risotto from the tureen, then click on the tureen again to remove it. This doesn't look too bad, right? Take the key from under the piano. Get the towel from the reflection. Now this looks remarkably tidy. The cabinet needs a colour key code, which we don't have yet. For colourblind people, the buttons are in the order red, pink, yellow, blue, green. Also note the socket on the wall. Eww, what's that creepy thing?! Pick up the paper scraps from under the press. Something is written on them, but how can we read it? Check the Ali Baba picture. Click on the corners. Hey, it's shaking! But what is the pattern? Turn the picture over to get a key. Try the key on the drawer. Hey, it doesn't work! Who hid these keys in the wrong places? Yeah, probably me. Get the miso from the top left cabinet. Open the locked cabinet with the key. Get the nearly empty smartphone and the dish soap and sponge. The middle lower cabinet needs a 3-character code. But we haven't seen any, so how do we know it? Check the figures that show up. Is there any logical pattern to them? Get the ginger from the cabinet. Look at the worktop. Time to clean the mess. Click the kitchen utensils to place them in the sink. Click the items to wash them. Click each item to put it away (bowl, chopping board, bowls). That's every area. Now what? Exit the house and look around. There is a sign between the left two buildings. Hmm, that curtain looks a little odd. Note the pattern of the red discs. Return home and turn left twice. Use the curtain code on the cabinet doors. Click the first black bar twice, the third once, the fourth 3 times, and the last once. Get the deodorant from the cabinet. Put the two birds inside the cabinet to open the drawer. Get the charger from the drawer. Turn left and use the deodorant on the smell. Use the phone on the charger, and use the complete set on the wall socket. Look away, then look at the phone again. Hey, it's charged a bit! Take the phone and enter the PIN. Remember what it is? Switch on the phone's Wi-Fi. Go to the fish shop (the left building) and go to the back room. Use the phone on the TV to switch it on. You will see a sequence of colours (the names will be underneath, for colourblind people). Go back and use this code on the robot cabinet. Get the cookbook and the kettle. Read the cookbook for instructions. In the kitchen, turn on the tap, then use the kettle on the water. Put the kettle on the hob. Go back, then get one of the small pink cups from the top right shelf. Add the ginger (top bottle in inventory) and the miso (bottle just above the book), then add salt (rightmost shaker), then add the boiling water. Give each of the sleeping kitties some ginger soup to wake them up. Click the table cloth to fold it up. Click the folded cloth to put it away. Take the rubbish from under the table. Turn right twice and take the garbage from the dust box. Go outside and drop the garbage at the garbage dump. Go back in, and enjoy your cake rolls from the kitchen cabinet. OK, I'm missing something with the color code for the cabinet. I tried something like the sheep, but the colors don't quite match up. Also, what am I supposed to do with the Ali Baba picture? I have the risotto crumbs, the cat charger, the scraps of paper, the ginger soda, and the miso. I also have the ginger bottle from the chicken cabinet, and I used the risotto somewhere when I wasn't paying attention. Still need 5-color clue, tilty picture clue, various keys, teapot, soap and sponge, phone, power ranger. And I'm out. Thanks mrjprive and jiffypop! but nothing seemed to happen. I can't believer I missed this one earlier today! I really enjoyed playing it. Anyone else find this one to be much easier than the first? Any clues for the color code on the cabinet? That was confusing, considering how many things just wouldn't work because it was not their time to work. The color code clue comes after you solve the wobbly picture. The wobbly picture clue...that's the one I refer to in the review, it's easy to miss because it's not something you'd intuitively pick up. Here's a hint: if you can take a look at something, or someone, then there is a reason. Look in the mirror, then you'll see what you need. You can't take down the tea cup until the counter is clean and the water is ready. How the heck does JiG find these crazy japanese or chinese games??? i don't see how to do the Happy End. I noticed on the left, the person who wasn't there originally is there behond the counter, and on the right, the charachter is watching the TV, but there's nothing to click on them. then go eat some cake, that should trigger the Happy End. But all your chores have to done first. Make sure you grabbed the charger from the wall after you used the phone. Then eating the cakes should trigger the happy ending. o i'll check that out hyperspeed. i thought i did that though but i might play it again to be sure.